The City of Eureka, Missouri, has a new playground providing accessibility and enjoyable play for children of all abilities. “We are so excited about the new playground and feel strongly about incorporating inclusive play into our recreation facilities. The space is for children of all abilities to have accessible and enjoyable play spaces in the City of Eureka,” said the mayor of Eureka. The City of Eureka, Missouri, has a new playground providing accessibility and enjoyable play for children of all abilities. The new playground includes ramps leading up to play spaces, transfer platforms, surfacing that allows for easier accessibility as well as various components that encourage sensory and music play. The area will be capable of accommodating up to 160 children ages 5-12 years old. The City of Eureka was approached with the opportunity to purchase a play structure at a discounted rate. 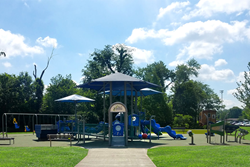 The playground was originally ordered by a school that lost funding for their project, but this gave the City an opportunity to purchase the equipment at a significant cost savings. The project is being funded through the city’s half cent sales tax. Located near the baseball fields and trail head, the Legion Park playground will be used for daily recreation and summer camp programs. PlayCore recognizes Legion Park as a Play On! and 7 Principles Inclusion National Demonstration Site following the research and programming of the Play On! Program, designed by PlayCore and scholar partner, SHAPE America, as it promotes physical activity through the six elements of play to create developmentally appropriate challenges and fun for all. In addition, the playground’s design is focused around the 7 Principles of Inclusive Playground Design®, as outlined in Me2®, a program developed in partnership with PlayCore and Utah State University’s Center for Persons with Disabilities. To continue to celebrate Legion Park’s commitment to advancing play and recreation through best practices, the park will receive a certificate of recognition, become a part of a network of potential research sites, and will be promoted actively to other communities wishing to create recreation spaces using design and/or programming. To locate the new site, visit http://www.playcore.com/nds/map.